When Jacob's (Asa Butterfield) grandfather is attacked, before he dies, he urges Jacob to go visit the home where he spent time as a young boy during WWII in Wales. Jacob is so traumatized that his parents take him to see a therapist, who agrees that Jacob should go to Wales for closure. 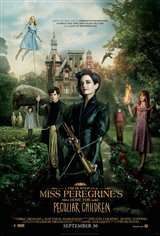 Once there, Jacob meets Emma (Ella Purnell), a resident of the home who takes him back in time to 1940 to meet the rest of the "peculiar children." He also meets Miss Peregrine (Eva Green), who takes care of the children and protects them from Hollows – creatures who kill people for their eyes. As Jacob gets to know the children, he realizes he has more in common with them than he thought.